Update: I’ve edited the post’s headline because the original came across completely wrong. If you saw that one and were put off, rest assured – so was I when I saw it later! The occasional Speaker Academy series, which started here, provides a bit of free advice (worth every penny) for patient voices who know how to give a good talk and want to make a business out of it. 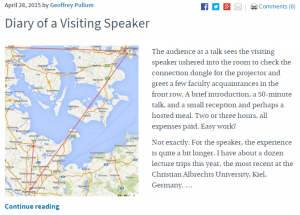 Today’s informative edition is a post by Edinburgh professor Geoffrey Pullam on the Chronicle of Higher Education‘s Lingua Franca blog: Diary of a Visiting Speaker. Now imagine that you’re asked to do this “hard work” for free or almost free. That’s the world of a patient voice who’s asked to take time off from work and family to come speak to an academic or professional audience. Some can afford that, but most can’t – and ironically, the more “experienced” a patient is (i.e. the more medical problems they can speak about), the harder it is from them to donate time. Advice to those who invite patient voices to participate: realize that you’re not just asking for the time in your session, you’re asking for a lot of time away from the home or office or both. Advice to those who want to speak and change the world: realize the same, and that if you want it to be sustainable (i.e. not a clever new way to go bankrupt), you need to be sure it’s economically viable. Even if you personally can afford it, you may want to insist on an honorarium, to set precedent for others. That’s part of changing the culture. There’s a big “habit problem” as we try to crack our way into the academic medical establishment: when they invite a “visiting speaker,” they’re accustomed to it being someone who has a salaried day job, for whom this is a funded field trip. Same for conferences, as well as invited lectures: the hosts aren’t yet accustomed to budgets that fully fund the work they’re requesting. Remember, all: the Institute of Medicine and World Health Organization have said for years that medicine needs to be “anchored on patient needs and perspectives” (as the IOM put it). To make that a reality, funders need to act accordingly, which means planning ahead as they think about guest lectures and conference speakers in the coming years. Please: adjust your budgets.